This anodized grill or griddle pan is 24cm (9½ inches) across and for a limited time includes a FREE panini press to toast your favourite ciabatta sandwich. Anolon Advanced is constructed from heavy gauge Hard Anodized aluminium which is twice as hard as stainless steel, making it incredibly durable whilst providing outstanding, even heat distribution, with no hot spots. 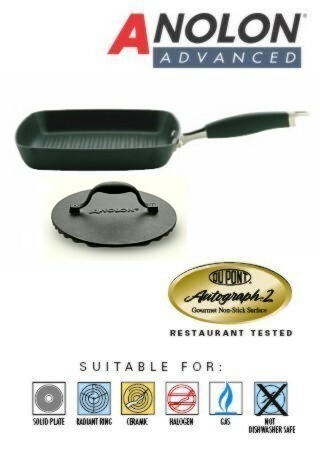 Restaurant tested by professional chefs, Anolon Advanced features Autograph™ 2 advanced non-stick technology, inside and out. It surpasses all other ‘standard’ non-stick formulas, delivering long lasting non-stick performance with superior durability, which stands up to the vigours of everyday kitchen use. The innovative, ergonomic handles provide a soft, cool, confident grip using a combination of 18/10 stainless steel and silicone rubber. They are durable and oven safe up to 180°C, 375°F or Gas Mark 4. A few simple rules if observed will ensure Anolon Advanced gives a lifetime of outstanding service. To preserve its non-stick surfaces, use wooden or plastic utensils. We recommend Circulon 2 Utensils to maximise its non-stick properties and avoid excessive wear during cooking. Hand washing in hot soapy water is all that’s required to clean Anolon Advanced to help you care for your cookware.